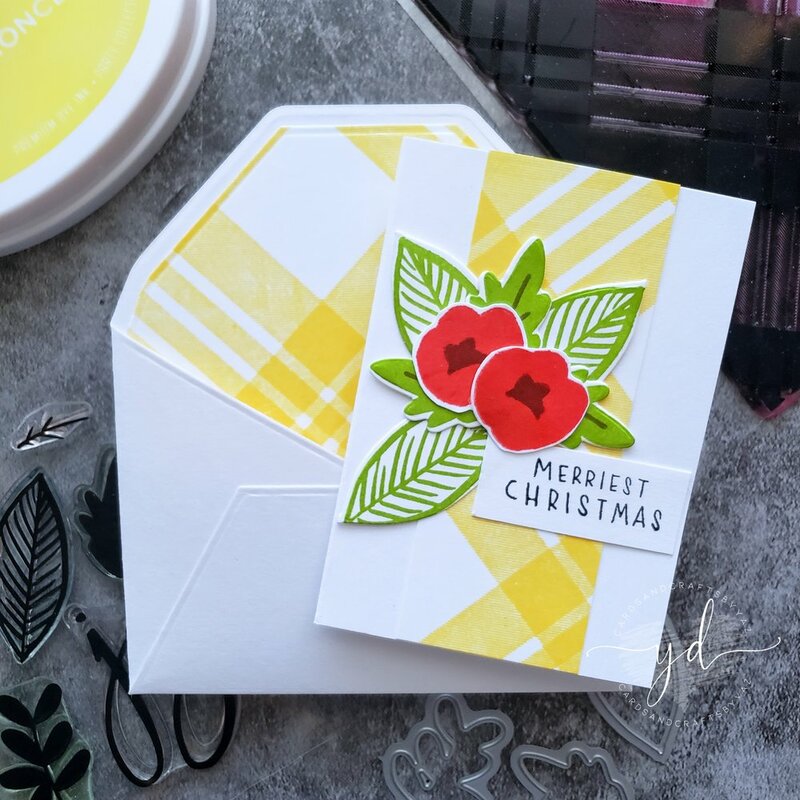 Hello crafty friends, On today’s Blog I’d like to share with you five simple ways on how to use the new Plaid Background, The Joyful Blooms and the Big Hi die from the November 2018 new release by The Stamp Market. 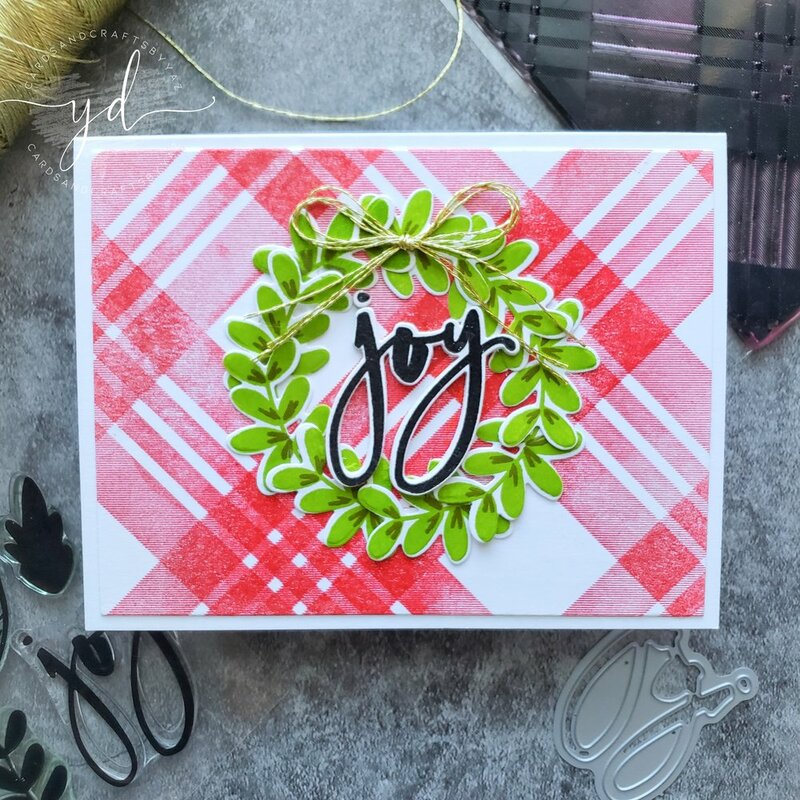 So let’s begin for this blog I created 5 examples with all the different backgrounds that I stamped in many colors with the Jumbo Plaid Background, along with Joyful Blooms that I stamped in coordinated colors to play along with the cards and envelopes. That being said, let’s get started! 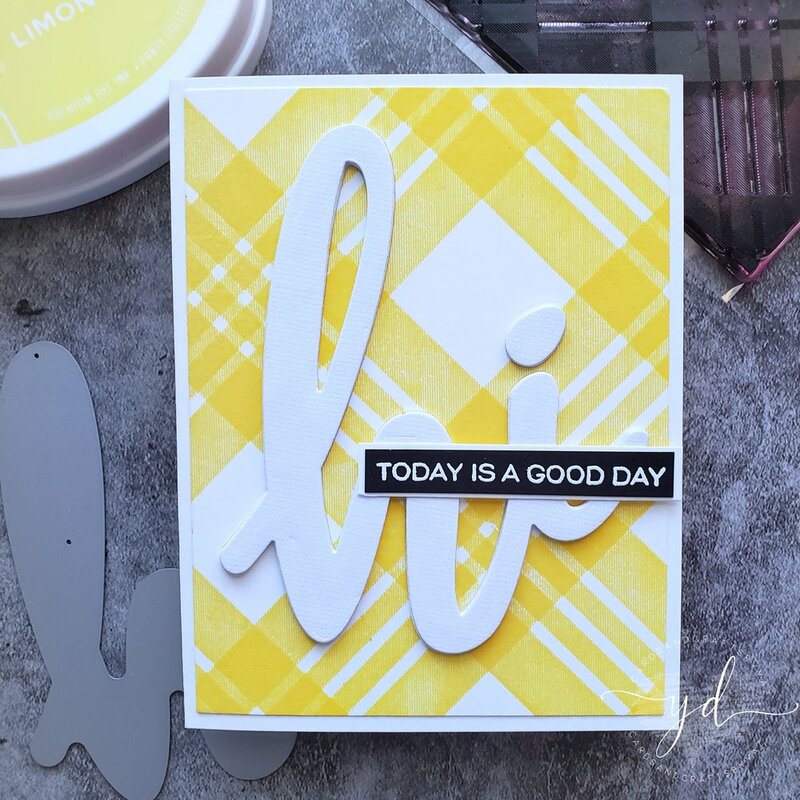 For the first example, I used the background that I had stamped in yellow color to create the die cutting by using the Big Hi die. Once I did the die cutting out the background, I set it aside by leaving just the negative part of the background as I was planning to create two cards with a single cut. So for this card I die cut 3X out of white card stock the Big Hi, because I wanted to add dimension to it. Then I adhered the backed of the background with liquid glue to an A2 size side folding white card base, also I stacked all of the white die cutting by adhering one on top of the other with liquid glue. Last but not least, I adhered the backed of it inside of the negative part and I added a sentiment that I had previously white heat embossed in a piece of black card stock from the Friendly Bunch stamp set. For the second example, I white heat embossed the Jumbo Plaid background on a white card panel. Then as my focal point I used the positive of the Big Hi, that I had from the previous card. For dimension I did an extra cut, but this time out of white fun foam. Next I adhered the white embossed card panel to an A2 size side folding white card base. Then I adhered the white fun foam to the yellow plaid big hi, and I adhered them both to the card panel. Also I added a flowers and leaves that I had previously stamped and die cutting with the coordinated die from the Joyful Blooms stamp set on one of the sides to the big hi just to added a little bit of more interest to the card. For the third example, I created a decorative mini card with its envelope. So I started by die cutting out white card stock the envelope with the Envelope and Liner die. Next I die cut the liner for the envelope out of the yellow plaid background that I had previously stamped with the Jumbo Plaid. Then I reinforced the scoring lines with the bone Teflon folder and I adhered them with double sided tape. To create the mini greeting card, I cut a piece of white card stock at W5.5” X H 3.7/8” and I scored it right at the 2.75” center point. Next I adhered in the center of the folding mini card a piece of leftover that measured W 1.5” X H 3.7/8” that I had from the background. 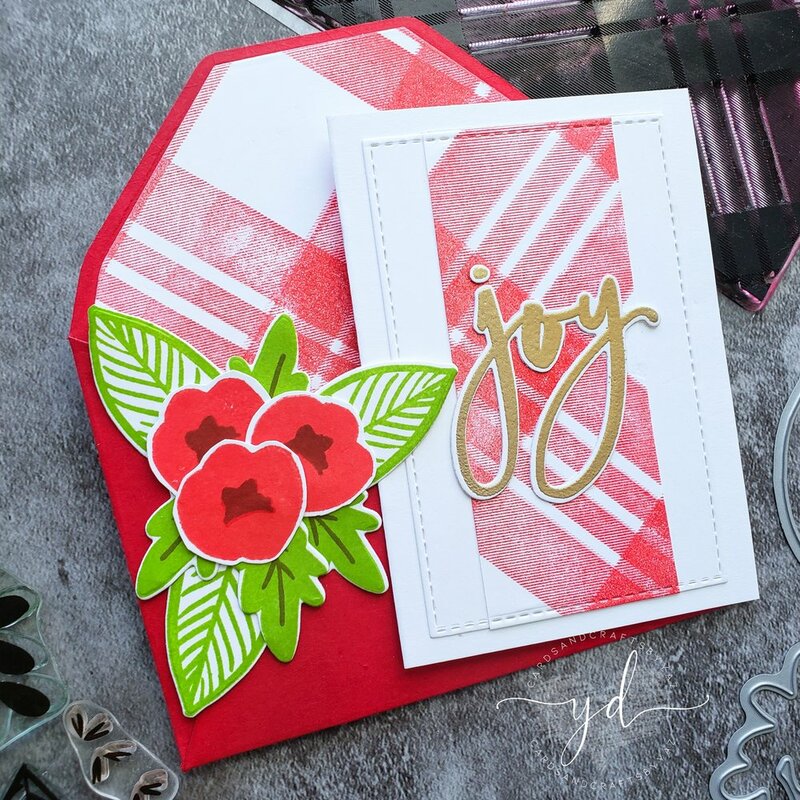 Then I adhered a few leaves and flowers that I had previously stamped and die cut in red from the Joyful Blooms stamp set. Last but not least I adhered a sentiment that I had also previously stamped in a piece of white card stock with black ink from the No Peeking stamp set. I don’t know about you, but I like to use non-traditional colors for my Christmas cards too. For the fourth example, I created a wreath with the leaves that I stamped and die cutting by using the Joyful Blooms & Coordinated dies. 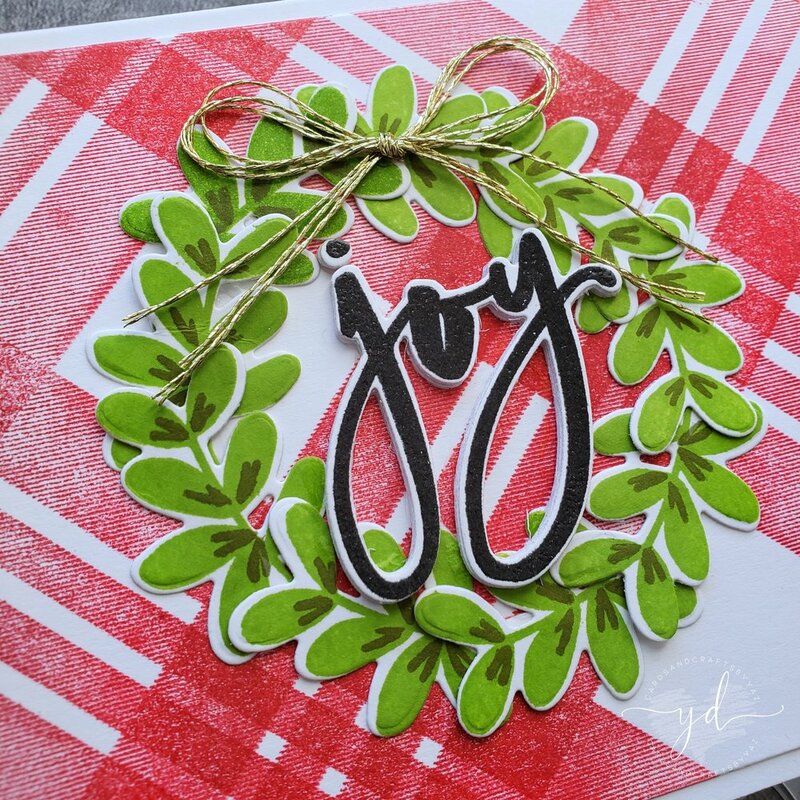 So for this card I used nine leaves to created the wreath, then I stamped the Joy word with the stamp from the same stamp set and I die cutting it with its coordinated die along with another three more cuts that I did out of white card stock. That step was optional, as I did it just to raise and leveled the word with the leaves as they created dimension after I adhered one on top of the other as you can see in the next picture. For the card panel as you can see, I use a red plaid background that I had previously stamped with the Jumbo Plaid Background in which I adhered the wreath and the Joy word. So I adhered the backed of the card panel with liquid glue to an A2 size side folding white card base. For the Fifth and last example, I created another mini card and its decorative envelope. For the envelope: I started by die cutting the envelope out of red card stock and the liner out of the plaid background that I had previously stamped in red. (All the step were the same as the previous envelope in this post.) The only difference between in them were that I decorate the actual envelope in this example. I am no affiliated or sponsored by any company mentioned here. All products are purchased by me. I Use and Love them.